For the Eastern softball team, the schedule just might get easier before it gets a whole lot harder. 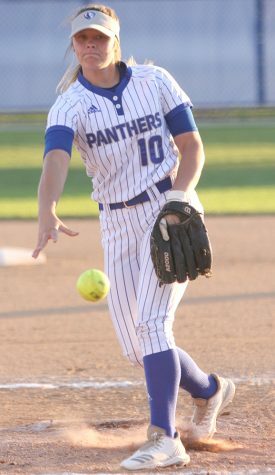 Eastern freshman Hannah Cravens throws a pitch in the Panthers’ 13-0 loss to Southern Illinois Edwardsville on April 9. Eastern plays Butler on the road on Wednesday. 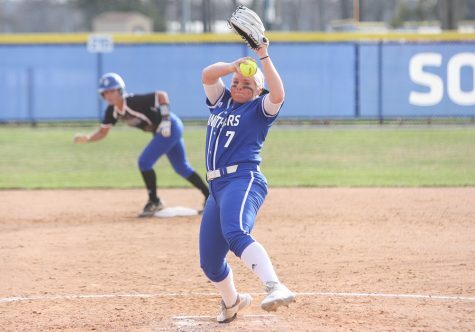 After hammering the 0-12 Morehead State softball team, by scores of 9-1 and then 12-6, Eastern Kentucky held Eastern to zero runs until junior Mia Davis homered in the seventh inning of game one and Megan Burton followed suit in the sixth of game two. Eastern Kentucky managed to take its seventh consecutive win at the conclusion of its doubleheader with Eastern, the second of which had been decided in the final four innings, as the Colonels, particularly senior Destinee Lizzmore, splintered whatever parity existed up to that point. Lizzmore, in fact, doubled and singled twice over the duration of an eight-run rally that endured for three straight innings. Now, however, the Panthers head east, as they play Butler, currently last in the Big East hierarchy, on Wednesday before going west to confront Southeast Missouri. Considering their winless series versus Georgetown, how much frustration could these Bulldogs pose? That all depends on who Butler head coach Scott Hall goes with on the mound for Wednesday night. Just maybe, if he so chooses, Scott could hand the ball over to senior Kaitlin Doud, who has thrown twice as many games of five or more hits than ones in which she delivered a shutout. Or there’s reliever Dani Dueschle, who has an ERA of 16.20 on the year. But then, of course, he has freshman Madison Seigworth, who, at 11-13, has been the most reliable arm in the bullpen thus far. 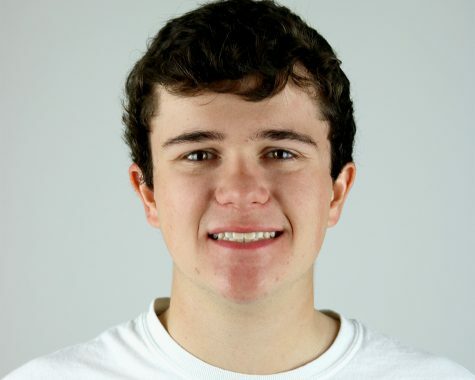 Schuette’s bullpen will encounter a Southeast Missouri team for the back end of the road trip, and one that, in the second of two Murray State games last weekend, handed down the slaughter rule on the Racers this past Monday. It epitomized just how much the Redhawks have prospered in the batter’s box this season, though no number illustrates this better than .319, their conference leading batting average through 43 games. The victory, and the fashion in they won it, was no small feat for the Redhawks, defeating the most preeminent team in the OVC. If Murray State came in to the road series fearless, having handled the season with aplomb, they left it frazzled, muddled and shocked, perhaps even humbled in only their third loss to date. After all, the first place Racers possess a respectable 8-7 road record, fourth among Ohio valley Conference foes, and the victors in six of their last seven games.